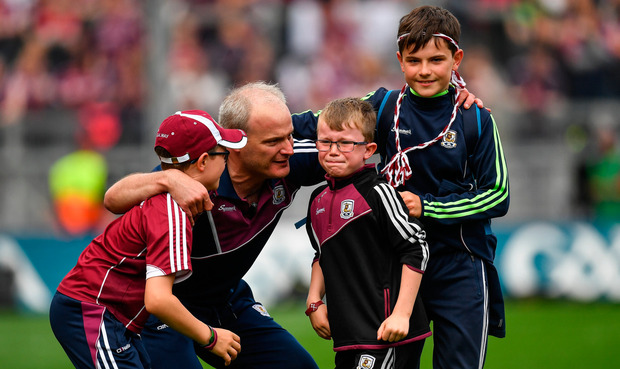 All-Ireland-winning manager Micheál Donoghue has revealed the personal abuse he suffered when Galway were relegated in his first term in charge and again earlier this year when they failed to get promoted. Donoghue praised the Galway supporters for the way they got behind the team during their all-conquering season in 2017 and said he was delighted that they were able to enjoy such success. But he said that the personal abuse which is dished out when a team loses is over the top. Two days stand out for him in that regard, the first came when they were relegated in the spring of 2016 just a few months after he was appointed to take over from Anthony Cunningham, and again earlier this year when a home defeat to Wexford scuppered their hopes of a return to the top flight. "The reaction we got after that was phenomenal. I know people think that if you lose you are entitled to get the criticism. But we were getting phone calls, letters to the house, over the top. "I remember two days, the day we got relegated, coming off the pitch, the personal verbal abuse. I don't mind taking criticism, you have to when you are in the game. "But when someone comes in front of you and gives you personal abuse and starts insulting you and your family that's a bit over the top," he told Galway Bay FM in a Christmas interview. Donoghue, who went on to lead Galway to the league title, the Leinster SHC crown and their first All-Ireland in 29 years, said the reaction to their league defeat to Davy Fitzgerald's Wexford at Pearse Stadium in the spring was also difficult to take. "I just felt the Wexford game, not about me, we are in this position, we do everything for the players and they are number one, 100pc. You do everything to protect and mind them. But I just felt it was over the top. "We were getting phone calls that we had to change this and do that and you would be very surprised from who. It was still only February, a clear plan and where we wanted to go and what we wanted to do. "Of course, it (the Wexford defeat) was a setback but the challenge for us at that time was how we are going to bounce back. Hindsight is 20-20 and it is great we can look back and say how we won it," added Donoghue. The Clarinbridge clubman, who is now heading into his third season in charge along with selectors Franny Forde and Noel Larkin, said that the reaction to their All-Ireland success has been great, but the attention is now turning to 2018. The squad are currently on a team holiday to the US and Mexico and Donoghue said that the sole focus will be on preparing for the new year when they return. "The reception and everything we have got since the game. The lads are on their holiday which is well deserved. "But I might ask people to respect that we are back in the groove of training again and our mindset is totally on 2018. "We probably still will be getting lots of requests in 2018 but from my perspective now we have got to get back to work. I hope people respect and are comfortable with that and we won’t feel it. "Our focus will always be totally on the lads and how we can improve. That's going to be our total focus once we come back in January. The other things are really important but people need to stand up and push them with this us." 2017 Hurling power rankings: Where does your county come on the list?